The gardens at Hever Castle are home to an ever-changing display of wonderful plants and shrubs throughout the seasons. With 4,000 rose bushes in the Rose Garden and more than 20,000 spring bulbs and 15,000 bedding plants planted in the gardens annually, you are guaranteed a breath-taking display no matter what time of year you visit. Spring is a wonderful time to view the gardens as spectacular carpets of snowdrops, crocus and daffodils welcome visitors. Walls are covered in camellias and tulips are in full bloom, as are the rhododendrons, azaleas and wisteria. Spring bedding includes hyacinths, wallflowers and pansies. 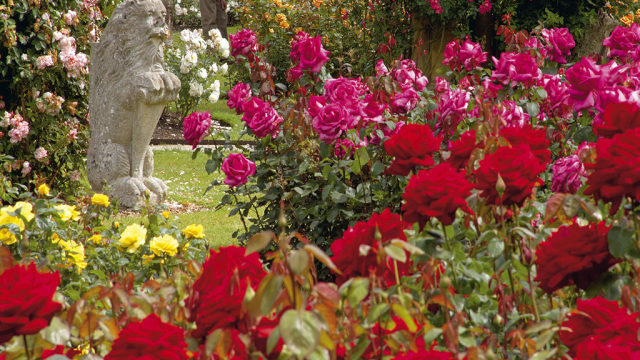 The roses at Hever are particularly admired, with more than 4,000 beautifully displayed bushes creating a kaleidoscope of colour and wonderfully perfumed aromas. As the days lengthen, the Mediterranean-style planting within the Pompeian Wall bursts into life and the herbaceous border displays hundreds of different perennials, each vying for attention. Autumn is the season when Hever’s striking trees come to the fore. The Dahlia Border provides dazzling displays in the early autumn and late roses can usually be seen. The Italian Garden maintains interest with its magnificent statuary and visitors strolling through the grounds may be lucky enough to catch the mouth-watering smell of the Katsura tree with its toffee-like aroma. As winter approaches, the warm red bark of the redwood trees glow against the winter sky and fruits glisten in the frost. The yew topiary stands majestically on the way up to the Castle with the Winter Garden displaying attractive and interesting colours and structures.